TORIES TRAMPLE TRANSPARENCY BILL The Conservative government has claimed it only charges “minor additional fees” to access its records and that the country’s information commissioner doesn’t need additional powers — despite evidence suggesting otherwise. Tory MP Dan Albas made those comments on behalf of the government in response to a Liberal bill that would partially fix Canada’s broken freedom of information system. The bill, entitled the Transparency Act, would eliminate all access to information fees, except the $5 charge for filing a request. Freedom of information advocates have criticized some of the government’s fee estimates, which can total hundreds, thousands or even over a million dollars. The bill would also give the information commissioner the power to order the release of records the government has withheld. The current commissioner, Suzanne Legault, has repeatedly asked for that power, which some provincial access watchdogs already possess, along with a mandate to educate the public about freedom of information issues. The parliamentary secretary also said eliminating access to information fees would “not show respect for the tax dollars of Canadians,” adding that 99.5 percent of requests are “fulfilled at no direct cost” beyond the initial $5 application charge. Nor, according to Albas, were the Conservatives supportive of the Liberal bill’s proposal that the government provide a “detailed explanation” when it refuses to release a record. SUNNY WAYS? 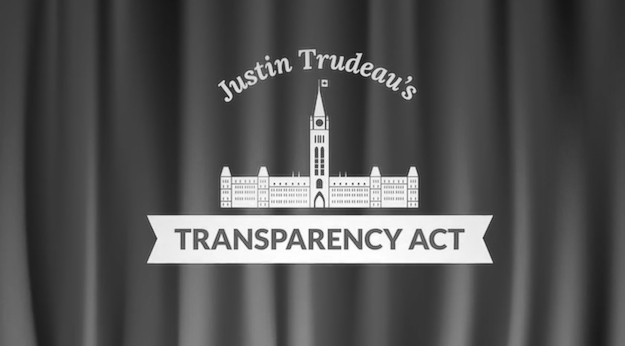 In an online advertisement released this week, the Liberals claimed their Transparency Act “will raise the bar on openness in government” — even though that legislation would preserve most of the hiding spaces used to keep information from the public. But I also wonder whether party leader Justin Trudeau will be able to hit that low bar if he becomes prime minister. Among the examples Martin cited was “the fixing of Liberal nomination battles to protect Trudeau’s star recruits” — despite an earlier commitment to have open nominations. While neither of these inconsistencies has to do with open government, in my experience politicians who want this kind of control are also strangers rather than friends to freedom of information. Which means Trudeau’s promises to bring more sunshine into government may be as fleeting as those made by Conservative leader Stephen Harper before he became prime minister. • respondents think whistleblowers, the police, voters, party leaders, ethics commissioners and auditors general all have more responsibility for policing political ethics than the media. The study was conducted online by the Gandalf Group using a nationally representative sample of 1,039 Canadians. The margin of error is 3.1 percent. TRACK AND MAP RIGHT TO KNOW THREATS A coalition of civil liberty groups have built what could be a powerful weapon in the fight for more freedom of information in Canada. But the success of that project, which is being led by PEN Canada, will partially hinge on whether Canadians actually participate in it — as I did last week when I submitted a report on a now overturned decision to bar journalist Linden MacIntyre from appearing on the CBC News Network. However, Censorship Tracker partners, which include the British Columbia Civil Liberties Association, the Canadian Civil Liberties Association and the Canadian Journalists for Free Expression, will also be updating the site. • “Some provinces are taking steps to let the public know when agencies have failed to act on recommendations stemming from coroner’s inquests and fatality inquiries,” according to Postmedia News. • Global News online politics reporter Laura Stone writes that justice department records released via an access to information request blacked out the name of the executive director of a victims services’ organization — even though that name can easily be found on the Internet. • The Canadian Taxpayers Federation’s prairie director Colin Craig reports the Saskatchewan government responded with 72 pages of information, 66 of which had been blacked, when it was asked for information about the financial impact Canada’s aging population would have on the healthcare system. • The Vancouver Sun’s Chad Skelton lists 53 provincial government bodies that were “transparent and quick” in response to his request for public sector salary records. This entry was posted in Freedom of Information, Media on November 23, 2014 by Sean Holman.